PS3 is a new PostScript 3 printer driver implemented from scratch as a replacement for the old Acorn PostScript level 2 printer driver. This new driver offers many improvements over the standard Acorn driver leading to higher quality both when printing to PostScript 3 printers and when creating PDF files using the PostScript printer driver and Ghostscript (e.g., via PrintPDF or ps2pdf). The PostScript 3 driver is 32-bit compatible for Iyonix and A9home compatibility and also fully ARMv7 compatible, so it runs on the Cortex-A8 processor used in the BeagleBoard. The PostScript 3 driver has won the Icon Bar award for the best commercial product 2009. See the official announcement on The Icon Bar. The following example print of an ArtWorks file with four 256 colour sprites embedded in an OvationPro document demonstrates two of the improvements offered by the new driver. The output from the old PostScript level 2 printer driver (shown on the left hand side) suffers from badly degraded colours. The first printed sprite is not too bad but with each additional sprite that is printed colour quality gets worse. The output also suffers from pixel dropouts (as can be seen in the enlarged image) caused by the fact that there are not 4 images in the PostScript file as one might expect but almost 7000 tiny fragments. This kind of output can cause printers to render the file very slowly. The output from the new PostScript 3 driver (shown on the right hand side) renders all sprites with perfect colour accuracy and represents them as 4 images in the PostScript file as expected. Vastly improved colour quality of sprites with 256 colours or less. Vastly improved representation of unmasked and masked sprites with 256 colours or less: each sprite ends up as a single sprite object instead of thousands of little pieces as created by the old PostScript driver. 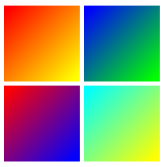 In contrast to the standard PostScipt driver, masks for true colour sprites (32 thousand or 16 million colours) are supported. Supports printing of Unicode text (i.e., enables printing from NetSurf under RISC OS 5 or on systems with a soft-loaded Unicode FontManager). Better output quality of RISC OS fonts that do not have associated PostScript information: Fonts are embedded as Type 1 fonts instead of Type 3. Uses heuristics to improve print quality from applications or OS modules that use the pre-RISC OS 3.5 "narrow" sprite rendering interface (e.g., all applications using the DrawFile module under RISC OS 4 or 5, such as EasiWriter, or all applications using the ArtWorks renderer modules under any version of RISC OS). Supports printing of CMYK sprites, even with masks. Support for arbitrary paper sizes without having to create files with PostScript code as the standard driver requires. Improved print quality of graduated (linear and radial) fills in files printed from ArtWorks itself (all versions) and in ArtWorks files embedded in documents of other applications (e.g., Impression, OvationPro and EasiWriter), in particular much better PDF conversion quality of these fills. Improved print quality of graduated (linear and radial) fills in OvationPro documents created using the Fill applet, in particular much better PDF conversion quality of these fills. Except from Impression, which bypasses the printer driver and uses its own non-mask-aware code. So far, all applications use their own non-mask-aware code because the standard PostScript driver cannot print CMYK sprites at all. Applies to ArtWorks files without transparency. ArtWorks files with transparency are printed as bitmaps to PostScript drivers and hence are not affected by the limited quality of graduated fills printed by ArtWorks to the standard PostScript drivers. The preferred payment option is a direct bank transfer in Pounds (from the UK) or EUR (from all other countries). Please enquire by e-mail for bank details. Alternatively, you can send me a cheque or order online using the buttons below. When ordering from outside the UK (and in particular, when ordering from within the Euro zone), please make sure you use the Euro ordering button, otherwise PayPal earns twice on currency conversions. Please note that the NetSurf 2.6 release version has a bug that affects downloads from this page. If you encounter any problems, please hold down the Shift key while clicking on any download links. After downloading you may need to set the filetype of the downloaded file to Archive manually. PS3 1.21 PostScript 3 driver version 1.21. 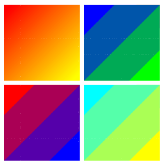 There is a new mailing list for RISC OS PostScript printing, which is the preferred location for PostScript 3 driver support. Subscribe now.